Despite China’s threat, the US House Foreign Affairs Committee passed the Taiwan Travel Act unanimously. On October 12, in spite of Beijing’s strong protest, the U.S. House Foreign Affairs Committee unanimously passed the Taiwan Travel Act, which calls for the complete lifting of restrictions on high-level visits between the United States and Taiwan. Unsurprisingly, the Chinese foreign ministry took a strong stance toward the committee action. While Hua’s strong remarks seem to be completely in line with expectations for most observers of China, what is really worth noting this time is Beijing’s unusual move before the committee’s hearing: the Chinese Embassy in Washington presented a formal complaint to the U.S. Congress, threatening “severe consequences” if the bill passed, according to The Washington Post. 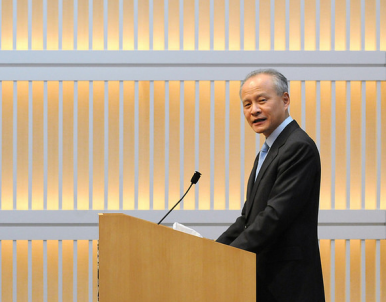 The Washington Post’s Josh Rogin reported that Cui Tiankai, Chinese ambassador to the United States, sent the letter to leaders of the House and Senate’s foreign relations and armed services committees in August, pressing them to “use their power to block Taiwan-related provisions in the bills.” Such bills “have crossed the ‘red line’ on the stability of the China-U.S. relationship,” the letter said. Beijing’s intention to sent the letter in the first place was to prevent the bill’s passage, but the tactic angered U.S.lawmakers and ended up being counterproductive. There is a saying by Confucius that is not only famous in the East but somewhat popular in the West: “Going too far is as bad as not going far enough.” The final result — that the U.S. House Foreign Affairs Committee unanimously passed the bill without being deterred by Beijing’s threat — seems to be a perfect illustration of the saying. Yet, before the bill becomes law, it still must win approval by the full House, then the Senate, and finally the U.S. president. Although most observers believe the possibility of the bill becoming law is very slim, it’s uncertain whether Beijing will make more counterproductive moves in the future. Tsai Ing-wen promises to stay the course on cross-strait relations, while pursuing “values-based diplomacy” abroad.